Having outlived her parents, four siblings, and many of her friends, Lavender Willis has accepted her own mortality. While she is still healthy and active in the enterprises of her organic farm, she recognizes that she needs to take steps to ensure that Lavender Honey Farms continues after her death. She knows that her two remaining nephews will sell the land with no concern about the farm’s importance to the organic movement generally and no vision of it as the legacy of the nephew, dead too soon, who began organic farming on these acres. With hopes of finding the right person to buy the land, Lavender invites the other three members of the Foodie Four, a tight group of bloggers drawn together by their interest in writing about food, to join her to celebrate her eighty-fifth birthday on June 30, the night of the blue moon. The three women make their way to Oregon’s Willamette Valley to honor their friend and to bask in the joy of one another’s company. The first to arrive is Ruby Zarlingo, a San Francisco chef still reeling from the unexpected end to a six-year relationship. Ruby, a survivor of childhood leukemia, is a free-spirited vegan whose blog, A Flavor of a Blue Moon, is a reflection of her delight in life and her interest in vegan recipes. Twenty-six and pregnant, she is still searching for her vocation. Valerie Andrews, Cincinnati’s first African American prima ballerina, initially sends her regrets, but she and her teenage daughter Hannah show up as a surprise. The two are making their way from Ohio to Val’s parents’ home in San Diego where they plan to spend the summer. Val and Hannah are both eager to find a new life in a place where they are not defined by a family tragedy. Although Val has not posted on her blog, Wine Dancer, since the tragedy two years ago, she has maintained her friendship with the other foodies. Ginny Smith, a supermarket cake decorator who found a new identity and significantly larger income when she began her blog A Cake of Dreams, completes the group. Ginny has spent her whole life in Dead Gulch, Kansas, dreaming of adventure in a larger world but too fearful of the risks to leave. Married young when she was pregnant with her daughter, now an intern at a Chicago hospital, Ginny is weary of her stultifying marriage and the friends who resent her success. She kept the level of her blog’s success a secret from those closest to her until a feature in Martha Stewart Living outed her. Lavender’s invitation gives her the opportunity to take her dog Willow and the classic Airstream she purchased and refitted with some of her new earnings and set off alone on the first adventure of her life. As the women gather at Lavender’s farm for a lengthy visit that will culminate in Lavender’s birthday party, they talk, laugh, remember, give advice, shop, cook, and plan Lavender’s celebration. Each woman examines her own life, and the friendship they share gives them the support and courage they need to make decisions that take them in new directions. Once again Barbara O’Neal gives her readers a story with powerful emotional punch, characters with the credibility and complexity of the person across the room from you or at the other end of your most recent text, and a setting that seems three dimensional—plus prose of rare lucidity and grace. Whether it is Lavender’s reminiscences of a long life well lived, Ruby’s mix of heartbreak and joy, Ginny’s elation with her freedom, or Val’s cautious hope as she moves beyond consuming grief, the reader is fully engaged with these characters, sharing their laughter and their tears, their wounds and their wonder. The sensory details of place leave the reader feeling as if she can see and smell the fields of lavender in bloom, hear the buzzing of the bees, taste Ginny’s streusel cake and Ruby’s watermelon salad, and feel the warmth of Lavender’s hug. Romance readers should be warned that this novel is women’s fiction rather than romance. There are two romance subplots: one between Ruby and Noah Tso, a veteran of the war in Iraq and Lavender’s farm manager and one between Ginny and Jack Gaines, a trucker she meets on her journey from Kansas to Oregon. The latter may present a problem for readers for whom adultery is a taboo in any circumstances. But the heart of the book is the growth and the friendship shared by this group of women of varying ages, ethnicities, and experiences. Because these friendships begin as online relationships, the novel will resonate with a particular strength for some readers. I confess that I’m an ardent fan of Barbara O’Neal/Barbara Samuel/Ruth Wind. Her books hold a prominent place on my keeper shelves, and I rush to add new books and reissues of her older titles to my Kindle. I know I can depend on her books to immerse me in a new world for the span of a few hours and leave me with my heart touched and my mind filled with long thoughts. 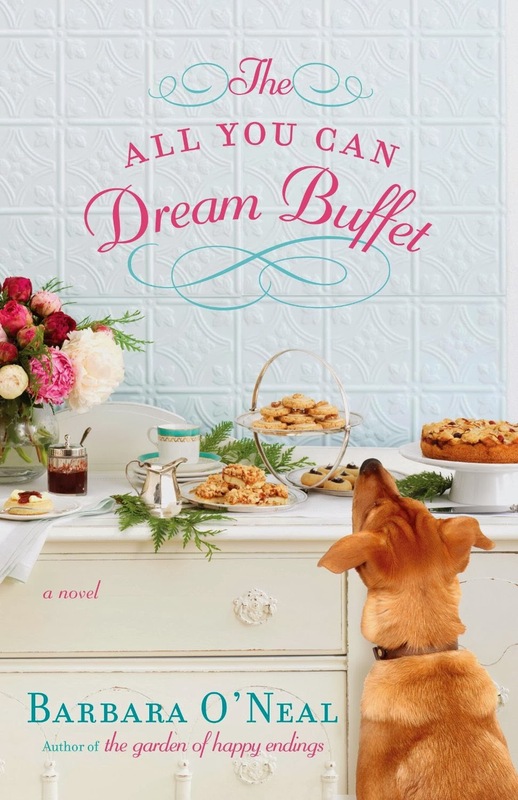 If you are a reader who values books that offer such riches, regardless of whether they are labeled romance or women’s fiction, I highly recommend The All You Can Dream Buffet. Janga, what a great review! I've had this one on pre-order forever and it should be here soon (fingers crossed!). Can't wait to read it. Like you, Barbara O'Neal in her various incarnations is a must-buy for me. And she's such a beautiful writer - she really has that rare ability to conjure a scene and immerse you in every sensual detail. She's a dab hand at emotional punch too - been a sobbing mess a few times when I've read her books although I always finish them feeling enriched by the experience. Great review! Sounds like a wonderful read! I don't think I have ever read Barbara O'Neal's works but it sounds like that is a gross error on my part. It's not my usual kind of read but I've been hearing a lot about this book and it does sound interesting. Anna, we share so many favorites that I'm not surprised to learn you share my appreciation of Barbara in all her incarnations. Thanks again, Janga, for bringing another good book to our attention. It will be a nice change of pace from the romances. As great as HEA's are, we all know life rarely works that way. An exploration of the real world, with real people, and real issues is something to look forward to, especially when handled by such a good author. This one will go to the top of my Wish List. I look forward to reading it. I have read all of Barbara's books except this one. So, I perfectly get the drift of what you are saying!